afternoon, one thought stopped me in my tracks, “I’m bored.” This was not the passing thought of another mundane, humdrum day but the kind that demands action. These next steps would determine direction. Embracing change, vowing to explore and choosing to try new things, I decided to live fully again. That day I threw on some sneakers and went for a ten minute run, a first since high school. While I didn’t love running immediately, I loved my heart racing, sweat pouring down my face. In those moments I had my first adventure, out of my comfort zone, exploring the physical world but more importantly exploring within. Since that small trek, my desire to experience more has only grown stronger, wider and deeper. Recently I landed in Moab, Utah; the self-described adventure capital of the West. 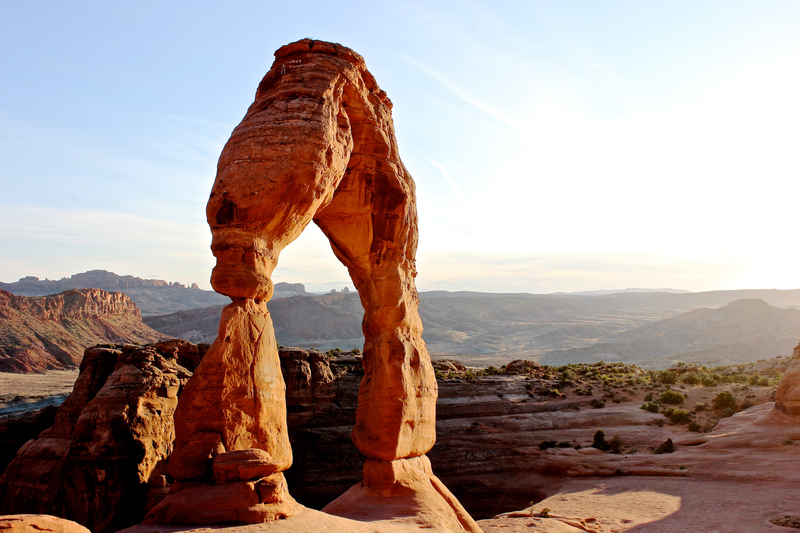 Utah, having five major National Parks has more than its share of natural wonders; but Moab is truly special. Hiking, rafting, trail running. Tour the arches and canyons from helicopter. Maybe try a rock climbing lesson or kick up some dirt off-roading a safari SUV. How about a treatment at the Sorrel River Ranch spa? From luxury properties to nightly campsite rentals, there’s an option for everyone. Arriving, I checked into the unique Moab Under Canvas for a night of glamping, or “camping for beginners” as a lady refreshing her coffee in the hospitality tent remarked Comfortable and cozy with a king-sized bed, dresser, sitting area, shower and toilet, my Deluxe tent was one part luxury hotel, one part Jon Krakauer novel. At dusk fellow campers circled the communal campfire sharing stories of their day’s journeys, sights and expeditions before retiring to their warm tents courtesy of old-fashioned, wood- burning furnaces. Awake at 5am to beat the sunrise, I unzipped the heavy canvas door, revealing a still night sky illuminated by the brightest of constellations and the humbling shine of the Milky Way. The stillness of this majesty broken only by the occasional falling star, I took in the quietness of this early morning seated on the front deck of my tent. What is it that happens when we sleep under the stars? A few short minutes, but a moment that will last through my ages. Suddenly from far on the horizon, the sharpest of rays pierce the night sky announcing a new morning. thought of another mundane, humdrum day but the kind that demands action. These next steps would determine direction. Embracing change, vowing to explore and choosing to try new things, I decided to live fully again. truly special. Hiking, rafting, trail running. Tour the arches and canyons from helicopter. Maybe try a rock climbing lesson or kick up some dirt off-roading a safari SUV. How about a treatment at the Sorrel River Ranch spa? From luxury properties to nightly campsite rentals, there’s an option for everyone. Arriving, I checked into the unique Moab Under Canvas for a night of glamping, or “ camping for beginners” as a lady refreshing her coffee in the hospitality tent remarked. Comfortable and cozy with a king-sized bed, dresser, sitting area, shower and toilet, my Deluxe tent was one part luxury hotel, one part Jon Krakauer novel. At dusk fellow campers circled the communal campfire sharing stories of their day’s journeys, sights and expeditions before retiring to their warm tents courtesy of old-fashioned, wood- burning furnaces. Relaxation at the Sorrel River Ranch and Spa, my next accommodations, was well earned after hiking through the landmarks of Arches National Park. A quick drive into the Colorado River Recreation Area, Sorrel River Ranch greets its guests with graceful horses gallivanting around a large corral. Nestled up against the mighty river, and facing twin mesas, the hotel could not be situated in a more picturesque location. An afternoon lounging and reading riverside led to a delicious room service dinner followed by a hot tub soak; a small bit of pampering before another day spent adventure seeking. Pushing my limits, stepping into the unknown, that next day was the main attraction of this Moab visit. In the early morning twilight, I began a fifty mile run, a challenge that would ask much of my body, play tricks with my mind and relay heavy on spirit. With some pains but greater triumphs, Moab’s unique landscape stripped me to my core.